We are pleased to provide a selection of window-hanging flags that are made in the USA! 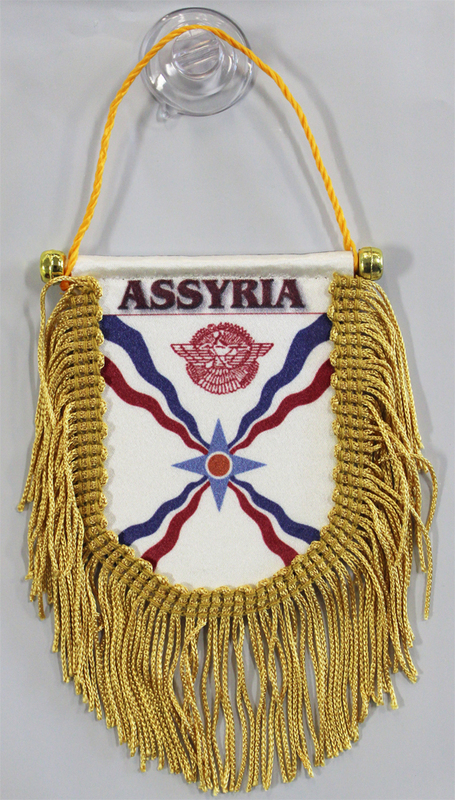 The Assyria window hangers feature extra-long, elegant fringe, measure approximately 3" x 4" (excluding fringe) and include a gold cord attached to a sturdy cross bar. The hand made mini banner can be displayed on a window or mirror with the supplied suction cup, or mount directly over your rear-view mirror. The Assyrian flag is the flag chosen by the Assyrian people to represent the Assyrian nation in the homeland and in the diaspora.